A few weeks ago – as the prospect of spending another winter here in rainy Portland began to dawn on me – I started looking into some travel opportunities in warmer climates. One of my goals as a blogger is to get to visit some of the intentional communities that I write about – and winter seemed like the perfect opportunity to do some exploring. Things fell into place really quickly. I discovered an eco-retreat on the Big Island of Hawaii called Hedonesia, that offers programs for interns, volunteers, and guests. The founder of the community lives part-time in Portland, so I got the chance to interview in person and show him around Foster Village, the eco-community I live in here. It sounds like a great fit! I’ve made plans to spend 3 weeks taking their Community Manager training program, after which I can stay on in a work-trade arrangement for several more months. I’m especially excited to learn the behind-the-scenes aspects of running an eco-tourism community, and to bring back some ideas to Foster Village. What makes Hedonsia so different than the communities I’ve lived in before? For one, it’s located in a rainforest setting, so the environmental challenges are unlike any of the climates I’m used to. Many of the living structures are made out of reclaimed materials: rather than being built to withstand the elements, they’re built to avoid mold. The open air buildings include bamboo huts, an eco-toilet, and a jungle shower. The property includes over 20 garden areas, so guests and volunteers can learn which plants grow on which plots of land and harvest from the many fruit trees. There’s even a volcanic crater with lava tubes that features a slightly steamier, less breezy micro-climate than the rest of the property. Hedonesia offers several ways for guests and volunteers to spend time in the community. One is to simply make a reservation (for $40-95 per night) in one of the huts or cottages. Another is to visit as a volunteer, which costs $60 per week in addition to 12 hours of volunteer work. A third option – the one I’ll be doing – is the internship program, which costs $600 for the first three weeks and then only two days of work each week after that. Volunteer responsibilities are divided into three kinds, and tailored to each individual. Body work includes yard and garden maintenance and trimming the jungle vegetation. Heart work includes contributing to creative and artistic tasks, or healing skills like yoga instruction or massage therapy. Mind work involves the organizational aspects of running the community, as well as web design and online responsibilities. Hedonesia describes itself as a eco-feminist community, and some of its projects revolve around empowering female entrepreneurs to bring back business ideas to their own intentional communities. 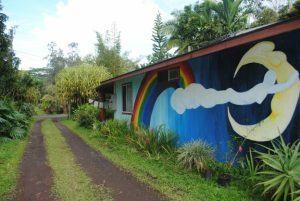 It’s also close enough to the town of Pahoa that visitors can spend some time exploring the “hippie district” of the Big Island. ← How can we bring more life to meetings?